31 Days of International Zine Month – The poster! Want to download a PDF page with two of these so you can make some yourself? Go here. Brainscan zine #24 & #25 out now! or from My Etsy shop here along with lots of other ziney things. or My Artfire shop here. If you already carry Brainscan in your distro I’ll be sending you a sample copy. If you do not carry Brainscan please get in touch for a sample copy. Greetings from Richmond! Nicole has a spare room for me. With a bed! With sheets! I haven’t slept with sheets since I left! The Richmond zine fair was Friday night and all day yesterday. I’ll write more about it later. Last night we played and awesome game of Apples to Apples and had a lot of fun. nicole took me to a bottle shop and I geeked out over all the beers I had never tried. I head home tomorrow. I was feeling really homesick at the zine fair yesterday and wondering if I could get a sooner ticket home since my plane ticket is for Monday. I decided to stick it out. Here’s the working description for brainscan 24 and 25. I’ll post more when I’m home and they are available. 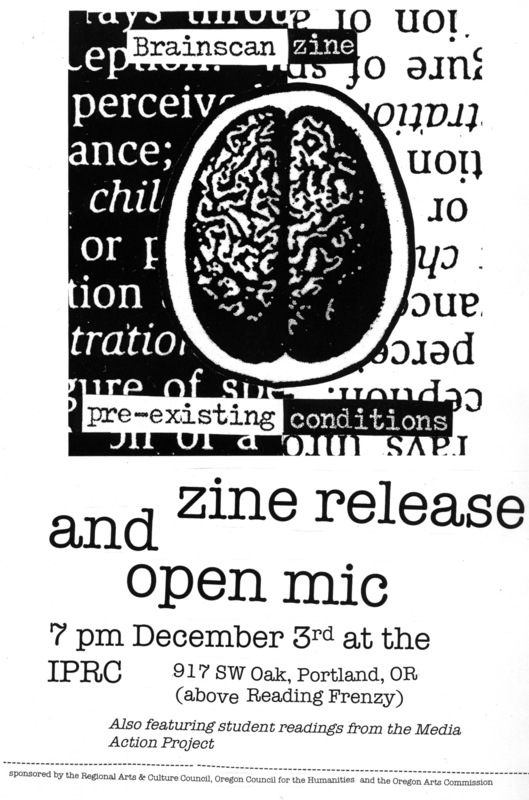 This zine has been five start and stop years in the making. I finally finished it in October of 2009 at the Anchor Archive zine residency in Halifax, Nova Scotia. Brainscan 25 is 80 pages, legal sized (8.5″x7″) transparency and cardstock covers, and an envelope containing a 16 page epilogue. These two zines together will be $5 plus $2 shipping for a total of $7. I feel sort of bad for the price but the zine is 80 pages and the copies I have now cost over $3 each to make. Stolen Sharpie Revolution 2! Preorder NOW! Since 2002 Stolen Sharpie Revolution has been the ultimate guidebook to all things zine related. This little red book is stuffed with information about zines. Things you may know, stuff you don’t know and even stuff you didn’t know you knew for the beginner to the experienced zinester. Stolen Sharpie Revolution consists of how-to guides on a variety of topics from layout to book binding to paper making, resources online and off, where to find zines, information about zine libraries, how and where to get your zine distributed, reviewed and more! For 2009 Stolen Sharpie Revolution has been completely rewritten and expanded to 144 pages with new a layout and includes the previous information, updated resource listings for stores, distros, zine events and zine libraries. It will also contain all new sections on zines in academics and education, a guide to the US postal system, what to do at a zinefest, how to start a zine fest, lots of internet resources, and more! This book has everything you need to get started creating your own zine or to figure out what to do with the zine you already made. Stolen Sharpie Revolution 2 can serve both as an introduction into the wide world of zine culture, and the next step to being a part of it. Stolen Sharpie Revolution 2: A DIY Guide to zines and zine cultures is now ready for PRE-ORDER! Orders will be shipped in Mid April. Stolen Sharpie Revolution is printed with vegetable based inks on 100% recycled paper and bound with animal free glue. Nobody Cares About Your Stupid Zine Podcast coming soon! I have been doing a bit of work on the Nobody Cares About Your Stupid Zine Podcast today! I have been registering stuff online, talking to Paul and Androo about the theme song that Androo wrote and writing interview questions for Marc, and set up Saturday as our first day to record! I guess Androo wrote a hilarious theme song on a Ukulele and bongo drums that is filled with lots of silly ziney cliches. I haven’t heard it yet but Paul says it is hilarious and ends with “nobody cares about your stupid zine”. They are going to record it soon so I’m stoked!. Our first episode is basically going to be updates from zine land and Marc and I Interviewing eachother. We don’t want it to be too long and drawn out and are hoping for about 15 minute shows. I got a cool little digital recorder for interviews and stuff too and have been playing around with an audio program teaching myself to edit. It should be good times! More details to come. Last night Jess came over and brought wines as per usual. We made a lentil garbanzo pine nut pilaf that was really good and well spiced, it went well with the wine. We also worked on planning our fancy vegan wine pairing dinner party and decided to do it at my house, watched the cats go nuts with catnip and listened to Dan and Paul Play DJ in the dining room. tonight Paul has a band practice and I think I might just curl up in bed with a book and some tea and get myself out of the office!